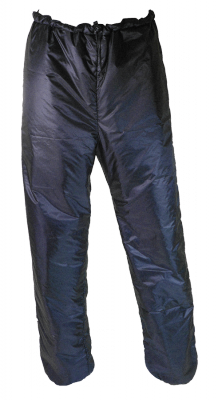 Warm trousers filled with synthetic insulation for camping in cool and wet conditions. Now also available in custom sizes. *Please note: we make our stuff sacs big enough to allow fairly easy stuffing rather than reducing the gear to the tightest minimum. These Primaloft trousers/pants are now also available in custom sizes. Specify Waist and Inside Leg sizes independently to order made-to-measure synthetic-insulated trousers/pants. This tailor-made service can cope with sizes from XXXS to XXXL and is ideal if your waist to inside leg ratio differs from standard, ready-to-wear patterns. With a combination of synthetic insulation (Primaloft Gold®), our lightweight MX fabric, and a light and simple design, these synthetic-filled trousers are the perfect choice when it's going to be cold and damp. In our experience the Primaloft Gold® synthetic insulation absorbs water much more slowly than other synthetic waddings, a marked advantage in cold, wet conditions. Please note: If you order a custom-sized version of these Primaloft trousers they will take longer (approximately 45 days) to be manufactured ready for dispatch. Custom-sized versions of these synthetic-insulated trousers are not returnable and customer loyalty discount cannot be applied. A mini-ripstop nylon with excellent tear strength, MX is the pick of the superfine 15 denier downproof materials. We have tested lighter fabrics, but most have had significant drawbacks, while our confidence in MX is based on several years of extensive use in both our ultralight and our high mountain gear. Primaloft Gold® is the ideal microfibre insulation. Ultrafine fibres produce an insulating core that is incredibly soft, lightweight and water resistant. In our experience it absorbs water much more slowly than other waddings, a marked advantage in wet-cold conditions. The PHD Sizing Chart below is based on measurements without clothing, exactly the way you would buy a pair of trousers. Inside Leg is measured from crotch to ankle bone. Once you've selected your Waist size you can specify the Inside Leg size up to two sizes bigger or smaller. For example, a trousers or salopettes with a medium (M) Waist can have XS, S, M, L, or XL Inside Leg. If you have any questions about your size, please contact us. Waist. Use the chart below to find your Waist size. Measure yourself without clothes. Inside Leg. Use the chart below to find your Inside Leg size. Measure yourself without clothes from crotch to ankle bone. N.B. PHD clothing is unisex. 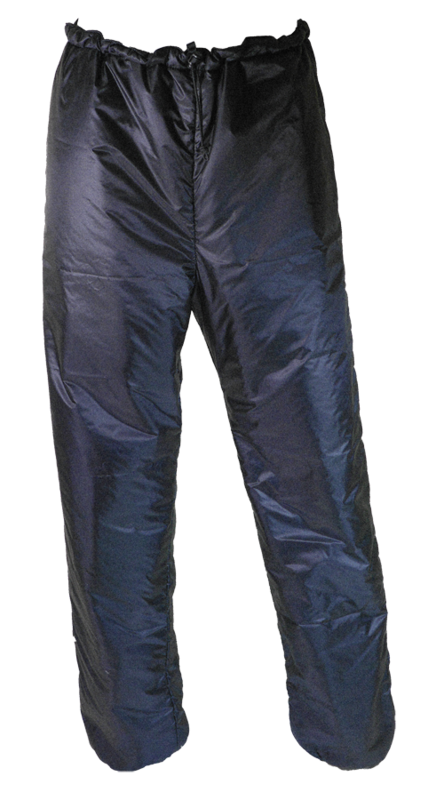 Down Trousers & Salopettes are sized to fit over thermal underwear &/or climbing trousers. "I put them on and instantly felt the warmth they provide. They seem so brilliantly designed and manufactured. One of the reasons I keep coming back to PHD gear is that I know it's made in the UK and that it's made exceptionally well." "Probably my cold weather 'gear of the year', if you pair these insulated trousers with ... a winter jacket ... you'll be set up for whatever the season ahead throws at you. I have insulated alpine pants that are 3 times the weight and less warm than these. For me, synthetic insulation is a better choice than down in more cold weather conditions, as they are much more likely to get damp at the knees, seat and ankles. These are insanely warm, disperse moisture rapidly and scrunch down tiny. Serious clobber for serious conditions. I am genuinely impressed." A synthetic-insulated lightweight jacket. Robust fabric and Primaloft Gold-fill to cope with damp and wet conditions. Now also available in custom sizes. Lightweight socks filled with synthetic insulation for camping in cool and wet conditions. Cookies on the PHD website.